Before the Predator attached the name "drone" to an anti-terror war machine, many militaries flew unmanned planes as targets, so that pilots and anti-aircraft gunners could practice shooting moving objects. Target drones are still flown today, both specific target models and ones converted from old jets specifically for this purpose. In the past, targets were generally plane-sized, and militaries used anti-aircraft weapons to shoot them down.A group of hobbyists with a weirdly extensive machine gun collection decided to try a modern update to drone target practice. In this case, the targets were smaller drones ranging in size from remote-control toy airplanes to larger flying wings, about as big as the Army's hand-tossed RQ-11 Raven. Instead of special anti-air weapons, they tried a few different machine guns, which are more representative of the weapons insurgents might aim at drones. 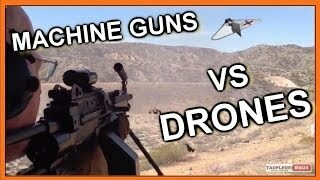 While many of the bullets fired hit the drones, it took direct hits to the tiny drone engines to make them stop flying. Verdict: It's possible to bring down small drones with a machine gun, but it takes good aim and many shots—and it helps if the drone is just flying back and forth in front of you. This target practice was part of the Big Sandy Shoot, an event in Arizona put on by a group of machine gun enthusiasts. Their spring shoot was the first week of April. For added fun and insanity, there was a night shooting session, where people shot at drones bedecked with glowsticks.